Patient is a 1-day-old male who was found to have a small cutaneous hemangioma overlying the lumbosacral region. Birth history and physical examination are otherwise unremarkable. Ultrasound images demonstrate a tethered spinal cord, extending to the L5-S1 level. There is also a subcutaneous echogenic mass, which has an intrathecal component that appears contiguous with the cord (Figure 1). 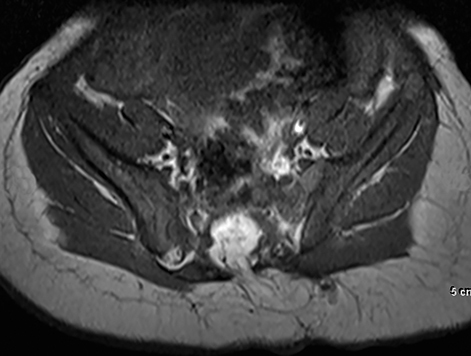 Noncontrast lumbar spine MRI shows a focal fatty mass (high T1, T2 signal) in the sacrococcygeal region with an intrathecal component. This mass causes tethering of the spinal cord. The fatty mass extends through a defect in the posterior elements of the sacrum and is contiguous with the subcutaneous fatty tissues (Figures 2, 3 and 4). 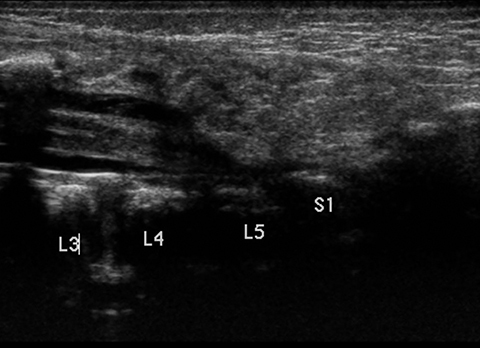 Ultrasound will demonstrate a low-lying spinal cord tethered by a lipoma. The lipoma will be contiguous with subcutaneous tissues of the back and extend through a posterior bone defect to insert on the cord. Sonographic findings that suggest a tethered cord include low positioning of the conus (normally ends between T12 and L2-3) and decreased/absent “to-and-fro” motion of the cord during real-time imaging. 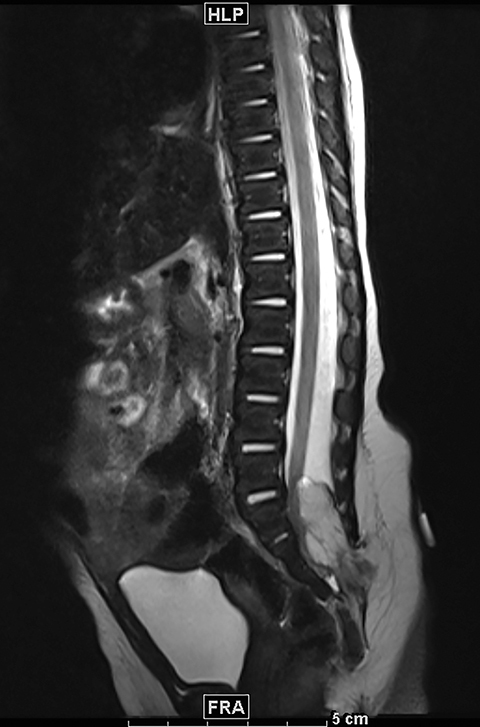 Occult spinal dysraphic disorders such as lipomyelocele are an uncommon but clinically important diagnosis in the pediatric patient population due to the high risk of significant neurologic impairment. These disorders are often initially detected on ultrasound after the discovery of lumbosacral skin stigmata on physical examination. 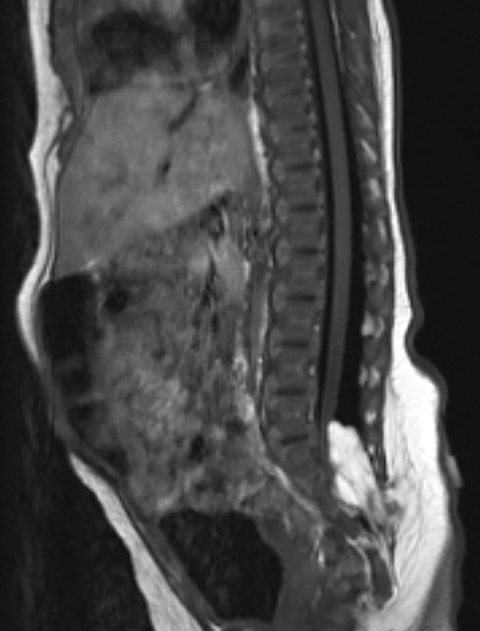 MRI is useful for confirmation and further characterization of ultrasound findings. Medina LS, Crone K, Kuntz KM. Newborns with suspected occult spinal dysraphism: A cost-effectiveness analysis of diagnostic strategies. Pediatrics. 2001;108(6):e101. Shin M, Besser LM, Siffel C, et al. Prevalence of Spina Bifida among children and adolescents in 10 regions in the United States. Pediatrics. July 2010;126:274-279. Rufener SL, Ibrahim M, Raybaud CA, Parmar HA. Congenital spine and spinal cord malformations - Pictorial review. AJR. March 2010;194:26-37. Muthukumar N. Congenital spinal lipomatous malformations. Acta Neurochirurgica. 2009(151):179-188. Korsvik HS, Keller MS. Sonography of occult dysraphism in neonates and infants with MR imaging correlation. RadioGraphics. 1992(12):297-306. VanDreel AM, Sutherland JE, Henkle G, Wilczysnki MA. Lipomyelocele in newborn. Appl Radiol. 2016;45(11):53-54. Prepared by Dr. VanDreel while a Diagnostic Radiology Resident at Franciscan Alliance – St. James Hospital; Dr. Sutherland while a Radiologist at North Ottawa Community Health System in Grand Haven, MI; Dr. Henkle while a Radiologist and Assistant Program Director; and Dr. Wilczysnki while serving as Chairman of Diagnostic Imaging and Radiology and Residency Program Director at Franciscan Alliance – St. James Hospital in Olympia Fields, IL.